This post was written by peterjmurray on January 25th, 2015 8:42 pm Comments Off on MOKEE SNOW! Following a great visit to West Melton Primary in my home-town of Rotherham – thanks to Ian and Zoe for making Kath and I so welcome – I decided to go to the New York Stadium and watch Rotherham United v Bournemouth…the first match I’ve been to for a LONG time! Although I thoroughly enjoyed the match, it was disappointing to see the Millers lose 0-2, even though they played really well. During the game it snowed and I got to feel very cold. 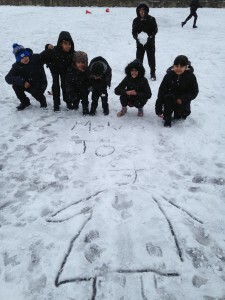 Little did I know that this snow was only the start of a whole load of the ‘white stuff’ we were to encounter the following week during our visit to Whetley Academy in Bradford. We launched our Mokee Joe books with gusto at this wonderful school. They had a theme of ‘GIANTS’ running through their curriculum and so our very own seven-foot tall monster made his presence more than known during our four days there. Mrs Gavin and her totally enthusiastic staff ensured that our week flew by and everyone seemed to get something from our visit. We’ve almost been adopted by Whetley Academy now and are looking forward to lots of future visits. Watch out all you staff and pupils…YOU AINT SEEN NOTHING YET! school close to the M4 around Cardiff – Dolau Primary. We’d no idea what to expect at this school, it was a first visit owing to the sister of one of the staff there recommending us. We accepted everyone’s warm welcome (extremely warm!) and launched into our updated Mokee Joe presentation. Little could have prepared us for the impact of the presentation! The next day we were inundated with artwork related to our books and loads of ideas for my next Mokee Joe book suggested by ‘wannabee’ authors! Brilliant! We signed books until my arm almost dropped off and headed back down the M4 trying to stay one step ahead of snowy weather. As luck would have it, we arrived back in our Berkshire base just as the snowy weather closed in. Wow! Close shave! Thank you to Mr Hopton, to the lovely Head and all of the VERY welcoming staff and pupils for making our trip down the M4 so worthwhile. We WILL be back…count on it! ALL PUPILS GREAT AND SMALL! This post was written by peterjmurray on January 18th, 2015 5:53 pm Comments Off on ALL PUPILS GREAT AND SMALL! We have got off to a ‘cracking’ start in ‘James Herriot Country’ up in the Yorkshire Dales. Leyburn Community Primary School was our first port of call and a HUGE thank you to the head teacher, Ms Sarah Beverage, for hosting our visit and involving three other great schools – Middleham Primary, Spennythorne Primary and Hawes Primary. 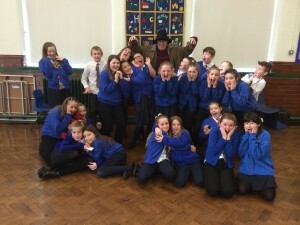 On our first day we did a big Mokee Joe presentation in front of all four schools and things seemed to go down extremely well with lots of excited pupils eager to read the books…some subsequently e-mailing me to say that I inspired them to become authors themselves…brilliant! Follow-up workshops were carried out at all four schools over the next few days, talking about short-story writing (scary ones of course!) and again, all went down very well. I’m hoping at the time of writing this blog that lots of Dales pupils have since written some great spooky stories of their own. Maybe some will arrive on my doorstep for me to take a look at! Fond memories of our first three days back at work? A lovely cosy cottage in Leyburn with a roaring open-fire, lovely coffee shops in Leyburn, wedding cake and wine supplied by our good friend Ms Jo Dobbs at Middleham Primary, unexpected snow causing some excitement – especially on our way back to Hawes and Spennythorne for book signings, tasting endless cheese samples at the Wensleydale Creamery in Hawes…and lastly, meeting so many enthusiastic pupils and staff in this beautiful part of the world (even in the depths of winter!!). THANK YOU TO ALL…SEE YOU AGAIN SOON!